Epson has announced the Epson Stylus Photo R2000, a wide-format printer targeted to advanced amateur photographers, hobbyists, and creative professionals. The new unit, which features the company’s pigment printing technology, is designed to produce vivid, archival prints with a glossy look and feel. In addition to pigment-based inks, the 13-inch printer offers flexible media handling and larger capacity cartridges that deliver up to 50 percent more prints, the company says. The printer can accommodate a range of papers, including cut sheet and roll paper, photographic and fine art media, canvas, art boards, and CD and DVDs. Its networking options include both Ethernet and wireless connectivity as well as USB 2.0. 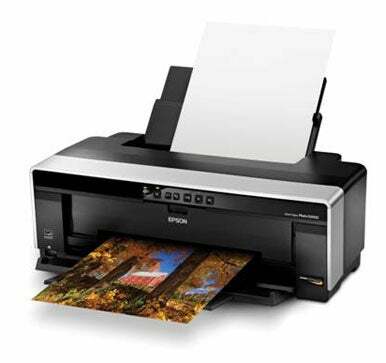 The R2000, which replaces the Epson Stylus Photo R1900 ( ), uses Epson’s MicroPiezo AMC print head and UltraChrome Hi-Gloss 2 ink. The eight-color ink set takes advantage of Epson’s high-gloss encapsulated pigments, including an enhanced gloss optimizer that the company says creates photos with a uniformly smooth finish. Image quality is further enhanced by AccuPhoto HG screening technology, which is designed to ensure high image quality even at higher speed modes. Epson’s UltraChrome Hi-Gloss 2 ink is designed for gallery-quality archival prints. It is water, smudge, and fade-resistant. Red and Orange inks promise bold colors and smooth, natural skin tones. Additional printing advancements offer more vibrant greens and intense blues. An enhanced gloss optimizer delivers a uniform gloss finish, and auto-selecting Photo and Matte Black inks deliver deep blacks on matte, fine art, or glossy media. AccuPhoto HG Image technology is a mathematical architecture and advanced screening technique designed to ensure precise placement of each ink droplet to produce smooth, grain-free images. This technology helps to maximize color gamut, smooth transitions and gradations, and achieve consistent color under different lighting conditions, Epson says. The printer’s new Automatic Ink Density Optimization feature helps to deliver prints with consistent pigment density and excellent color accuracy. The R2000 automatically selects Photo or Matte black ink to produce the deepest blacks and richest color on glossy, matte, or fine art media. The eight-channel, precision MicroPiezo AMC Print Head produces a maximum resolution of 5670-by-1440 optimized dots per inch and variable-sized droplets as small as 1.5 picoliters. The print head has an ink-repellent coating for decreased maintenance and increased reliability. The printer uses individual larger-capacity ink cartridges to deliver up to 50 percent more prints than the previous model. A main top-loading, high-capacity auto-sheet feeder supports photographic and matte papers. A rear, single-sheet, fine art paper path handles heavier fine art and specialty media. Roll paper support allows for panoramas up to 44 inches long, even on canvas, and a front, straight-through path handles media up to 1.3 mm thick, as well as direct CD and DVD printing. The R2000 features built-in 100 Mbit Ethernet for wired networking, 802.11n wireless technology, and USB 2.0 for multiple connectivity options. The Epson Stylus Photo R2000 will be available in May for $500. It has a one-year whole-unit exchange limited warranty plan as well as specialized technical support staff. Additional information is available on the Epson Web site.